The landscape painter Thomas Christopher Hofland was inspired by the riverside scenery at Richmond and Twickenham. He was born in Worksop, Nottinghamshire, the only child of a wealthy manufacturer of cotton-mill machinery. His family moved to London in 1790, where his father was ruined by imprudent speculation. In 1817 he moved with his wife Barbara from Richmond to what is now number 8 Montpelier Row in Twickenham (because of re-numbering, the Rates Book shows him at number 10). He exhibited over 70 paintings at the Royal Academy, but to his disappointment was never elected a member of this elite establishment. 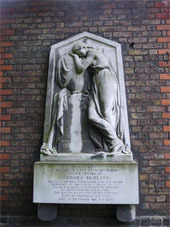 He was, however, a founder member of the Society of British Artists. Hofland supplemented his income by teaching at Kew. One of his pupils was George Hilditch, who carried on the tradition of landscape painting in the Richmond and Twickenham area and whose work, like Hofland's, is represented in the London Borough of Richmond upon Thames Collection. The river provided recreation as well as inspiration; Hofland enjoyed fishing in the plentifully-stocked Thames so much that he wrote a book about it. His more famous contemporary, J M W Turner, was frequently in Twickenham at nearby Sandycombe Lodge at this time; both used similar viewpoints for their paintings, and their paths must have crossed occasionally. 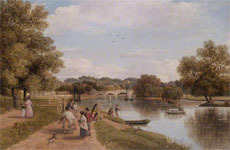 Hofland's charming oil painting of Richmond Bridge from the Towing Path, Surrey in the Borough Art Collection shows the bridge and Richmond Hill in the distance. It is a delightful, tranquil depiction of the river on a summer's day, reflections from the trees on the little islands, with leisurely encounters between horse-rider and passers-by, and dogs bounding along beside them. A pretty little passenger boat with a cabin is being rowed across the river to the edge of Twickenham Park, while a punt is moored on the Richmond side with two men who seem to be about to go fishing. Sail boats are near the bridge, and working boats, which are a reminder of the river's traditional route for carrying goods. Up on the tree-covered hill, there is a glimpse of The Wick and Wick House, and of the famous Star and Garter Inn. 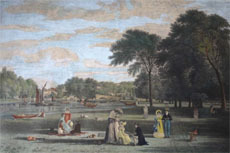 Hofland painted a companion to this view, The View from Twickenham Park (its whereabouts unknown) for Joseph Todd, owner of Twickenham Park between 1817 and 1820. The picture shows Richmond Bridge and Hill from the Twickenham bank, on the edge of Twickenham Park's grounds, again with lively groups of people, sketching, picnicking, strolling and holding alfresco music parties, all on a summer's day. This was sufficiently popular to be engraved for a popular market. “...choral songsters chaunt that peerless fair/whose inspiration taught a mortal's mind/to form this Paradise of all things rare/where art and nature, by attraction join'd/find all their beauties dwell, and all their arts combin'd"